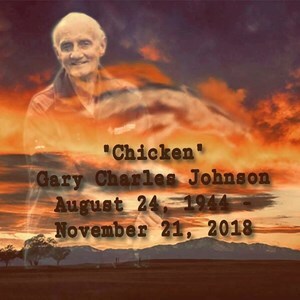 Newcomer Family Obituaries - Gary Charles 'Chicken' Johnson 1944 - 2018 - Newcomer Cremations, Funerals & Receptions. Gary Charles Johnson, 74, of Denver, passed away November 21, 2018 at his home. Gary was born on August 24, 1944 in Denver Colorado to Raymond and Geraldine Johnson. Gary joined the Navy on January 30, 1962. He received an honorable discharge and returned home to Colorado. Gary started working at Evergreen Specialty where he met the love of his life, Loretta. They were married on August 7, 1965 and were together for 53 loving years. Gary had a love for the outdoors camping, fishing, and hunting. He liked to play Bingo and most of all he loved the Denver Broncos. He had a passion for all types of music. He collected Bronco memorabilia and he enjoyed dancing and was known by most as "Chicken". He had a smile that would light up the room and a heart that was full of love. Gary is survived by his wife Loretta (Duran) Johnson; his three children, Gary Johnson, Denise (Johnson) Barnes and Eric Johnson; his son-in-law Jeff Barnes; his daughter in law Laynie Johnson; nine grandchildren, Jeffrey Barnes and his wife Jennifer, Shaun Barnes and his wife Dana, Dillon Barnes, Jeremiah Johnson, Chantelle Johnson, Brendan Johnson and Zachary Johnson; five great-grandchildren, Shaun Barnes, Dillon Barnes, Anthony, Mariah, and Aiyanna Johnson; two sisters Beverly Johnson and Christine Collins. He is preceded in death by his parents Raymond and Geraldine Johnson, his brother Robert Thielke and his grandson, James Charles Barnes. Add your memories to the guest book of Gary Johnson. We are so very sorry for your loss. We also apologize for not being there at the funeral. We found out he had passed away but we didn't know when the services were, we were told by Sherry that Gary had passed but she didn't know when his services were and we heard nothing from anyone else. So again please accept our deepest apologies. Dad and I know that Gary is with the Lord and all his Angels along with all of those we have lost along the years, along with my Momma Peggy. The families are reunited in God's kingdom where they are making a place for all of us to join them one day. Our prayers and Love we send to you now and always. I have known gary since i was 7. I will be 25 Dec 19th. Gary was an amazing guy. He no filter whats so ever that is what i loved best about him. One time gary took me to get formula for my twin daughters and they lady who was infront of was taking forever to pay. She was using both coins and cash. Gary was being so loud complaining that they kept switching from coins to cash. I was just laughing. There wasn't a time where he could make me laugh. I love you chicken until we meet again! Loretta, Gary's wife, is my first cousin on my mother's side and that explains how I met Gary Johnson. He was always so respectful to my mother and paid her sincere attention. But the best thing I can say about Gary is that he was an adoring and loving husband; crediting Loretta with making his life worthwhile. I greatly admire and respect that! I have known gary since i was 7. I will be 25 Dec 19th. Gary was an amazing guy. He had no filter whats so ever that is what i loved most about him. One time gary took me to get formula for my twin daughters and the lady who was in front of was taking forever to pay. She was using both coins and cash. Gary was being so loud complaining that they kept switching from coins to cash. I was just laughing. There wasn't a time where he could make me laugh. I love you chicken until we meet again! Gary - Grandpa chicken welcomed me and my children. He loved us. He treated my kids as if they were his own grand-children. He was so happy when I married his eldest Grandson Jeffrey. Gary was fun, loving and full of life. I’m going to miss him greatly. We love you Grandpa Chicken!